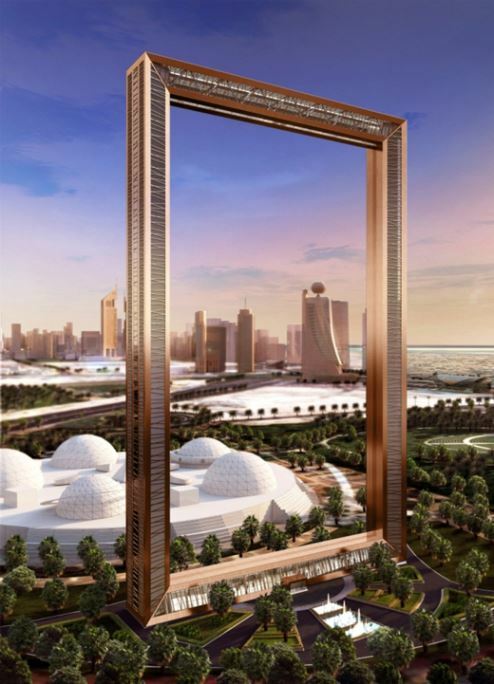 The Dubai Frame project has been fast-tracked in a bid to add yet another iconic attraction to the city’s growing list of world-class tourism highlights. The frame-shaped landmark, comprising two vertical pillars linked by a glass bridge, is already 85 percent complete, Eng. Hussain Nasser Lootah, Director General of Dubai Municipality, has revealed. Lootah recently stressed the need to speed up the completion of the project, which is located in Zabeel Park, in order to further cement Dubai’s status as one of the world’s leading cities. “On completion the building will become an iconic symbol added to an array of landmarks in Dubai such as Burj Khalifa and Burj Al Arab,” he said. Dubai Frame’s horizontal glass bridge is designed to create an experience likened to walking at high altitude. At the same time, visitors will enjoy 360-degree views of Dubai. The attraction will tell the story of the evolution of Dubai, with the ground floor museum displaying information about the city’s past and present using the latest interactive technology. It will also be home to a gallery showing old and new images of Dubai, a souvenir shop, and will provide visitors with access to the main panoramic elevator that travels through the rib of The Frame to the top floor. As well as a viewing area, the upper horizontal rib will house a café. Visitors will use the panoramic elevator on the other side of the structure to travel back down to the bottom.